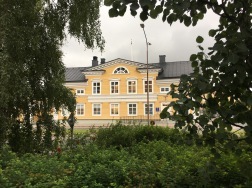 ArtNorth is part of Norrbotten County Council’s cultural program. The availability and provision of varied commissions secures the economic livelihood of local artists, which in turn enables them to pursue their professional interests locally. ArtNorth advocates the usage of the 1% principle and works to ensure that related commissions and calls for applications are executed appropriately. We actively promote local arts and craft makers on a national level. As a part of our activities, we also encourage local companies to invest in, and purchase, locally produced art. ArtNorth creates further education possibilities for professional artists in Norrbotten. This is done by collaborating with other educators and arranging further education events, workshops and lectures together with the local art scene. We also work to provide the inhabitants of our county, specially the children and the youth, with better opportunities for learning more about contemporary art. The creation of new exhibition outlets not only provides artists and craft makers with an opportunity to showcase their work but it also gives them a chance to meet their audience in interesting new settings. Examples include projects such as ‘Art for sale’, a temporary pop-up shop with local arts and crafts, and “Art at the airport”, where passengers get to experience art from Norrbotten already in the entrance hall of Luleå Airport and Kiruna Airport. Swedish Lapland AiR is a project run by ArtNorth, in partnership with other cultural institutions based in Norrbotten. The residencies will take place in 9 different areas of the region. Shaped by their unique identities, all those places will offer inspiring cultural and natural environments to the professionals, engaging them with topics such as local culture and art, history and nature. Therefore, every residency will be a one-of-a-kind experience with individual meanings, schedules and objectives. To achieve its goals, ArtNorth, works together with artists, organizations and companies. Do you have an idea that you want to share? Or would you like to collaborate with us? Please contact us so we may explore what could be accomplished together.